Adele Edwards, a 31-year-old woman from Bradenton, Flrida, has been eating foam from insode sofa cushions every day for the last 21 years. The woman remembers she first felt the bizarre craving when she was just 10 years old. Her cousin had decided to chew a piece of sofa for fun, and something inside her head just kept telling her she should try it too. She liked the way it felt in her mouth and although she started out by just chewing on the bits of foam and spitting them out, it wasn’t long before she began swallowing them. Three years ago, Adele woke up in the middle of the night, feeling an excruciating pain in her stomach, and after trying to get up she collapsed by the side of the bed. An ambulance rushed her to the emergency room, where doctors diagnosed her with a serious blockage in her lower intestines. After six days of trying to clear remove the mass, medical staff was getting ready for surgery, but fortunately for miss Edwards, the strong laxatives she was given were finally able to push the blockage through her body. Doctors were shocked when they saw it was the size of a grapefruit and made of pure sofa. Adele was diagnosed with Pica, a rare disorder that most commonly affects pregnant women and babies who lack certain nutrients, and which causes them to crave non-nutritive things like chalk, dirt, and even batteries. 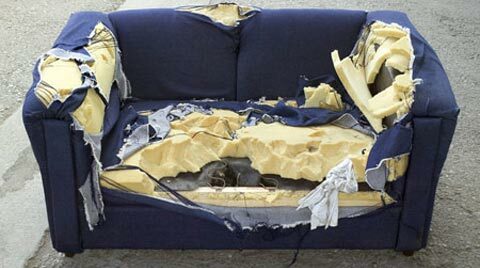 It can also be caused by stress, and the mother-of-five remembers she was in an emotional state when she first began eating sofas, as her parents were getting ready for a divorce. She says her life was out of control at the time, and her bizarre eating habit just seemed like something she could control. Today, Adele Edwards is trying to give up her addiction through therapy and hypnosis, knowing full well that if she keeps eating sofa foam it will probably kill her. Still, in the last year alone, she estimates she has eaten about seven couches, and right now she feasts on the soft treat about 15 times a day. Recently, she’s developed a crave for dirt as well, so she unzips a sofa cushion, tears off a big chunk, then goes outside and rubs it in dirt to make it crunchier. After her gastroenterologist heard about the dirt, he had Adele take some tests which revealed her blood contained about half the amount iron in a normal woman. She’s currently taking iron supplements which seems to be doing the job. Her family knows about the bizarre eating disorder, but Adele never does it in front of them. Her fiancé is making sure she’s cutting down on sofa foam, little by little, but she knows she will have to give it up completely if she wants to have a normal, healthy life. But, after doing it daily, for 21 year, giving it up is just not as easy as she had hoped.